The compact Citroen C3 Picasso MPV is about to hit our shores and no doubt we will be seeing a lot of them on our roads. There are still plenty of the older versions trundling around and so there will be plenty of buyers switching to this one. Critics of Citroen say their build quality isn’t that good but since I’ve owned Citroen cars, I can say they are much better than their reputation. Citroen designers also aren’t shy about adopting radical designs and some of that confidence has sneaked into the Picasso. 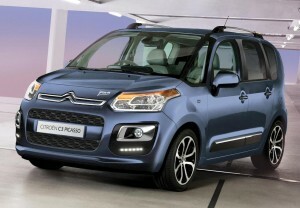 Restyling tweaks include a new front bumper and the newest Citroen logo redesign. Some models get daytime running lights (a bugbear of mine so I won’t be buying those) and the VT versions get a new hubcap design. The new Piccasso was unveiled at the Paris Motor Show in September and the engines have been slightly improved. As usual with the Picasso, potential buyers should have a look at the diesel options – the HDi 115 is particularly good. Though the HDi 90 manual VT version is worth considering because it could return an impressive 67.2mpg. There are new colour to choose from and some excellent technology options such as the new eMyWay sat nav system. Though in carrying out the raft of tweaks and upgrades I think they’ve lost the Picasso ‘look’ and it could be the Nissan Note or another model – but it will still sell well. The Picasso is on sale from next month, priced at £12,995. What will be 2014’s Car of the Year? This entry was posted in Car Updates & Releases, Family Car, New Cars, News and Views, Small Car and tagged caption, car, citroen, citroen c3, citroen c3 picasso, Citroen cars, LS, MoT, New Citroen C3 Picasso, nissan, nissan note, Paris Motor Show, picasso, price, technology, the Paris Motor Show, the Picasso, VT by Steve Lumley. Bookmark the permalink. Steve Lumley is a regular contributor to the First Vehicle Leasing Blog. With years of experience in writing reviews and features for national motoring magazines and newspapers, he brings lots of experience to the site.